With works by more than fifty artists on show (including a Londonista), the Press and Release hand made print exhibition at High Roller Society offers a brilliant chance to check out a range of art from an international (though mostly Londoner) mix of artists. The show is also a pretty good op to consider purchasing a piece of eye candy, with prints going for as little as under £20 (and nothing we saw at Friday night's private viewing costing more than £500). 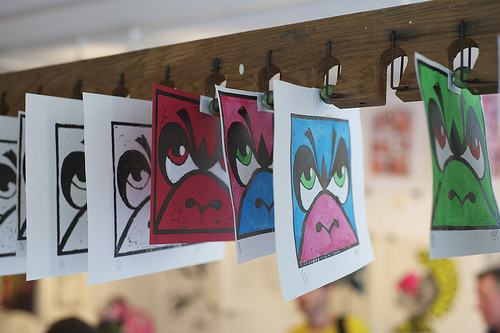 From vibrant one-offs by Paul Insect to down and dirty prints seemingly straight from the press by the prolific and prehensile Monkey, Press and Release is a contemporary look (with a street art edge) at an array of ancient and modern printmaking techniques. Mashing up age-old printing methods with those now available in our digitized world, the exhibition runs until the 24th of July at High Roller Society, 10 Palmers Road E2 OSY. Visit www.highrollersociety.co.uk for more info.